Several days ago, I asked my readers to contribute their favorite web tools to use for Instruction, and these websites made the cut! Here are 11 different web tools to use with your students either to engage and motivate, to provide alternative forms of assessment, or just to have fun with learning! Here's to the most DIGIGOGICAL 2011 possible! · Animoto - Animoto.com is a web application that creates MTV-style videos with the click of a button. It represents the end of slideshows as you know them! · Diigo – The web’s premier bookmarking, annotating, and social service, all rolled into one! · Dropbox - Dropbox allows you to sync your files online and across your computers automatically. Access your files anywhere, anytime, even on your mobile device! · Edmodo - Edmodo is a social learning network for teachers, students, schools and districts. · Glogster - Glogster EDU Premium is a collaborative online learning platform for teachers and students to express their creativity, knowledge, ideas and skills in the classroom. · LiveBinders - "Think of Livebinders as a virtual 3 ring binder that you can put pretty much anything in. Webpage, PDF, image, video, text: they all can go into a page organized for you. Each item can be on it’s own tab or you can further organize by using sub-tabs. You can even put LiveBinders inside LiveBinders inside LiveBinders!!" · Skype – Chat, Audio chat, Video Chat, Call Phones, Send Files, Share your computer Screen, share links and more with this incredible service. Connect to people all over the world! · Storybird - Storybirds are short, art-inspired stories you make to share, read, and print. Read them like books, play them like games, and send them like greeting cards. They’re curiously fun. · WallWisher – An online corkboard! Collaboratively collect notes, pictures, links, etc. Add items the way you would add a Post-It Note to a message board! DIGIGOGY End of Year CONTEST! To prepare for the end of the year, and to start the new year off on the right foot, I'm having a Web Tools in Learning Survey Contest! I'll use the collected information to write my last blog post of 2010! I'm giving away 5 of the brand new DIGIGOGY 2011 Calendar Magnets to random respondents to the survey. 1 Winner will get the Traveler Media Sleeve I got at a recent conference. 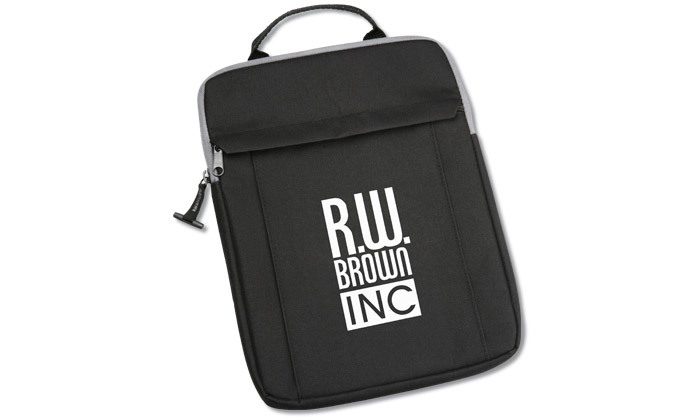 The sleeve pictured is an example of what it looks like, but the screen printing on the one I have reads NYSCATE and Skills Tutor, as they were the vendors that sponsored the bags! These sleeves would be great for an iPad, digital tablet, or netBook computer. If you want to be considered for the contest, please leave your email address in the survey. 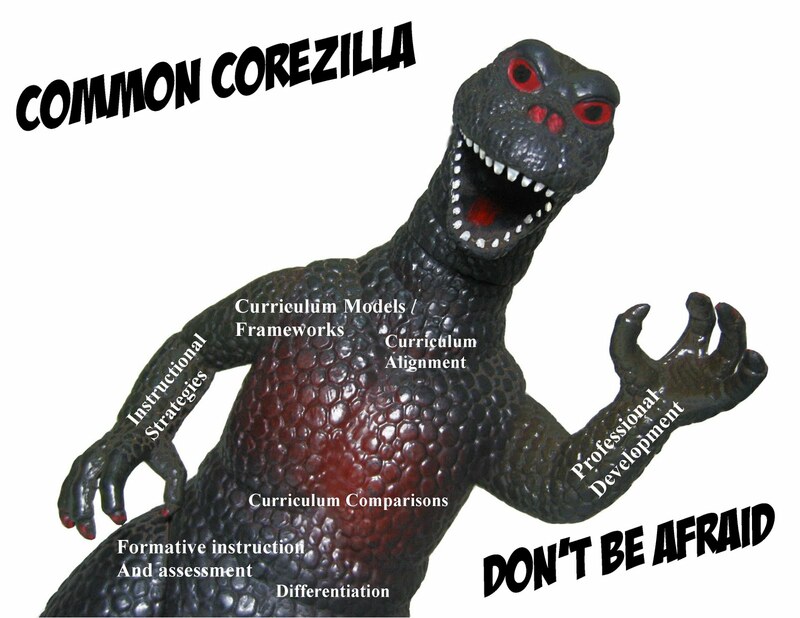 Common CoreZilla: Shrink The Change! Did you see Jurassic Park 2? There's a scene that pays homage to the old Japanese Godzilla movies where the Tyrannosaur escapes and runs down the street, with the people looking back, running away in terror. For a lot of educators, I think the Common Core Standards and the state-specific implementation plans are a lot like that Tyrannosaur. There are a lot of things to consider, sure, but we need to think of "shrinking the change," using a phrase from the Dan & Chip Heath book, SWITCH. A handful of 2-inch tall T-Rex's are a lot easier to deal with than their 2-story originator. Do you have curriculum models, frameworks, or maps in place that represent a child's journey through your system from K to 12? Do you have regular curricular conversation both horizontally and vertically? Do you prioritize based on essential skills and enduring or leveraged understandings? Do the teachers in your school(s) understand multiple ways to gather assessment data, and have "agreed-upon" formative checkpoints? Do you already have thematic units or genre specific models in place during the course of each grade levels curricular tracks? Do you provide supplemental guidance and resources for differentiated instruction, research based instructional strategies, and professional development for teachers, especially those that teach special education or English Language Learners? Any of these could easily be their own initiatives and last for months and months...but we don't necessarily have the gift of unlimited implementation time. BUT, if you are already doing some of these things--then you can check them off your RTTT list, and just continue doing them. Otherwise, you need to map out a plan of attack. The curricular framework or map is very important. Not only does it provide opportunities for curricular conversation and consensus, it provides a roadmap of sorts that documents what we intend as well as a diary of what actually happened. It is meant to be fully transparent, and help teachers situate themselves in the context of their colleagues. Bena Kallick (author of several books on mapping and data) talks about this when she discusses "Evidences versus Claims." It's not enough anymore to SAY what we think--we need to prove it. Having an articulated framework that shows how content and skills are related to specific assessments, and further how that impacts instructional practice, methodologies, and activities helps to enhance everyone's professional practice and build capacity around everyone's growth--students AND teachers! There are many books to help you get started with this, choosing from some of the heavy hitters in the field: Heidi Hayes Jacobs, Janet Hale, and Susan Udelhofen, just to name a few. Google any of the above for additional resources, but all educators should know about the above and how to implement the strategies and relate them to measurable student learning. Yes, there is still much to be overwhelmed about. You don't want the Common CoreZilla to eat you alive! I know this probably won’t be popular, but if I am going to continue to talk about “New Forms” in education, this needs to be on the table. I’m not saying get rid of all daily moments…assessment, anchors, general instructional arc…but the whole six point lesson plan thing seems to be a foot in the door of 1985. Or 1955. Perhaps the terminology is dated. I often say in workshops that teachers should stop the creation of the lesson “plan” and instead create lesson “events.” That which is memorable will stick. That which is traditional and “the same as always” will almost certainly be forgotten. Yet, in many schools, the traditional is so well entrenched that anyone doing great things is suspicious and certainly shouldn’t be trusted with children. Seriously. What do you remember about your school experiences? The worksheets you did? The drill and skill cursive writing? No? No memory of those things? I think I’m opening several cans of worms here. For one, what does the hierarchy of lessons look like if we remove the daily lesson plan, and two, is anything singular even worth planning for? Briefly, let me address both. A lesson typically fits into an instructional arc or subunit, tied into an overall unit, which is housed in a year of learning. This plan seems to me to perpetuate encapsulated moments that define when learning can take place. It’s kind of like going to the doctor on a Monday morning with a broken arm and the doctor saying that he’s sorry, but broken limbs aren’t dealt with until Friday, or maybe February. But then, that opens up the second can of worms. The singular content area lesson. One skill, one piece of content, one content area, one assessment…everything one at a time and separated from everything else. It’s all very neat and linear, but it seems very limiting. I have a hunch that sometime in the very near future, the definition of what a 21st Century educator is will include the total abandonment of singular content lessons. The future is in integration. There’s other cans of worms here…the reformation of assessment practices (Think Denmark! Think Japan! ), the realignment of associated skills with differentiated instruction and backwards design models, the deep understanding of curriculum design – specifically prioritization and consensus anchor knowledge, the singular student / singular product mode, etc. I’m thinking out loud here. If you’ve read this far, I hope it’s because you’ve either been inspired or angered. What are your thoughts? How do we innovate the “lesson plan?” How do we tear it down, build it up, upgrade it, dispose of it, or grow it? Or do we just keep the blinders on and hope for the best with what we’ve got? There is nothing more exhilarating to me as a teacher than seeing students do incredible things. When they are engaged and full of passion, they do really great work. Several weeks ago, I blogged about whether anyone was considering what the kids thought of education today. I asked students in an online survey to answer some questions about the state of things. I received a bunch of responses and wrote a follow up blog post with the findings of the survey. A group of students in North Carolina really felt empowered by the opportunity to share their voices, that they decided to take things one step further and create a digital representation of the changes they’d like to see! I had been in conversation with their teacher about having one of them “guest blog” for me, but I’m so impressed with what they’ve created, I’m posting ALL OF THEM here. Everyone who reads this blog needs to see what kids can do when they are inspired. These kids articulated the need for NEW FORMS in education, not just reforms. They want flexible scheduling, flexible spaces, flexible groupings, learning that matches their interests and is authentic. They do not want to be receptacles for information, in fact, one of them said to just “give him the basics” and let him figure the rest out on his own. - other peripheral skills related to teamwork, technology, etc. I want to give GIGANTIC kudos to these students, these scholars—who took an idea and ran with it for the sake of their own interest and passion. I encourage all of my readers to read and comment on what these students have done using popular Web 2.0 tools like GoAnimate and Storybird. These students wrote scripts, poems, narratives – and then kicked that work up a notch into the 21st Century. Way to go! Every single student listed here is the pinnacle of AWESOME! Once upon a time, a time in the present, there were three little students, Olivia, Ryan, and Casey. One sunny day, they decided to set out and learn something new. Their mother warned them to be careful and to watch out for students that might be better prepared than them. They told their mother not to worry and set off on their learning adventure. “Of course,” said the teacher, passing Olivia a pencil and a worksheet. Soon, she came upon another student who said she was on her way to college. She asked Olivia if she would like to go with her. Olivia went. At the college, they discovered that there was only room for one of them. Olivia was confident that she would be chosen, since she’d done so well with her teacher earlier. The people at the college interviewed both Olivia and the other student, gave them several types of tests, and looked at all of the learning they’d done in the past. Confident as she was, Olivia was not prepared, and did not get into college. “Of course,” said the teacher, passing Ryan an iPod, a netbook, a scientific calculator, and a project packet. Soon, he came upon another student who said he was on his way to college. He asked Ryan if he would like to go with him. Ryan went. At the college, they discovered that there was only room for one of them. Ryan was confident that he would be chosen, since he’d done so well with his teacher earlier. The people at the college interviewed both Ryan and the other student, gave them several types of tests and asked them to solve problems with various types of technology. Confident as he was, Ryan was only prepared to access information, not make connections and build something new from it, and he did not get into college. “Of course,” said the teacher, passing Casey an object he had never seen before. “What is it?” Casey asked. “That is what you will learn,” his teacher said. Casey was unsure of what to do next, but decided he should look online for pictures that were similar to his object. He asked his teacher if he could use a computer, and his teacher helped him find one. Casey thought it would be a good idea to talk to other students in faraway lands to see if they had seen a similar object. His teacher helped him connect. Casey looked in books, made notes, compared his notes with others trying to discover what the mystery object was, and drew conclusions based on the information he collected. The teacher asked Casey what he learned, and Casey was able to tell the teacher much more than just the identity of the mystery object. “You would do well to go to college,” the teacher told Casey. Soon, he came upon another student who said he was on his way to college. He asked Casey if he would like to go with him. Casey went. At the college, they discovered that there was only room for one of them. Casey knew he had done well with his previous learning, but was wary about what this other student might know. The people at the college interviewed both Casey and the other student, gave them several types of tests, and asked them to describe what they would do if they suddenly discovered a new species of animals. Casey used all of his skills for communication, collaboration, problem solving, and critical thinking and impressed the people at the college. He was rewarded for his skills by being asked to come to the college to continue his learning. Years later, Casey went to visit his mother, and it happened that both his brother Ryan and sister Olivia had had the same idea. Each of the students told their mother of their travels. Olivia and Ryan were surprised to learn that Casey had been admitted to college. Casey held on to his chinny chin-chin and smiled. For the holidays, I've put together some of my favorite holiday web tools and resources. Just click on the ornaments and enjoy! Elf Yourself - The every year internet favorite from Office Max! Augmented Reality Christmas (Click on Instructions when you get to the page) - I'm adding this to our Christmas Cards this year! Personalized Christmas Photo Gifts - A good friend, Katie H., sent this to me and it has lots and lots of different types of photo gifts!